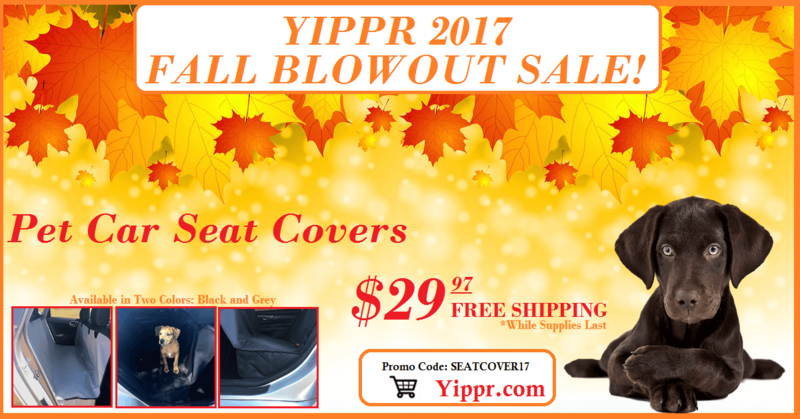 Yippr would like to help you keep your vehicle cleaner this fall and winter season! We are having a HUGE sale on all of our Hammock Style – Deluxe Pet Seat Covers! Originally priced at $49.97, you can save $20 right now! There is no limit on the amount you can buy at this price, and shipping is included in the price. We have two colors available, black and grey. At this price, you can afford to get one for every car you own and don’t forget the holidays are right around the corner. Any dog owner would love to own one of these! Don’t delay, this sale ends when we run out of our current stock! Sizing – Please measure your vehicle seat to ensure a proper fit. These premium quality dog seat covers are designed for cars, trucks and SUV’s with bench seats that measure approximately 54″ wide.